When it comes to make-up base and eyes are queen for me, everything else is a bonus! A flawless base and eye area can hide a multitude of sins... and yes I'm talking dark circles, blemishes and uneven pigmentation. Over the past year I've created a bit of a base wardrobe with go to products that fix me up time and time again. It's no secret that I'm not a good sleeper. It either takes me ages to drop off, or I wake up multiple times during the night, so my under-eye area is often a task for me first thing. A little while back I purchased the BECCA Under Eye Brightening Corrector and I've been hooked ever since. It's creamy pinky peach consistency neutralises the blue tones of dark circles and broken capillaries, whilst ultra-fine pearlescent particles subtly scatter light to brighten and enhance the under eye area. This really is an impressive corrector, considering its buttery texture it blends like a dream, is super long-waring and crease-resistant. It's the very best way to stay looking bright eyed and bushy tailed. Next up my old faithful the Collection Lasting Perfection Concealer for under £4 this is hands down my favourite multi-use concealer. It works so well over the BECCA Under Eye Brightening Corrector and together these two products banish any signs of fatigue. First up we have the BECCA Backlight Priming Filter primer, which does exactly what it says on the tin! It's the ultimate fix for skin showing signs of lacklustre skin and with it's intuitive free-radical fighting formula and a featherweight texture it's the ultimate first step to a soft focus flawless base. Next up we have the super affordable Natural Collection Tinted Moisturiser which is perfect for those days when you only need sheer coverage, mixed with the insanely versatile Clinique Bronzing Gelee this is actually one of my favourite bases! 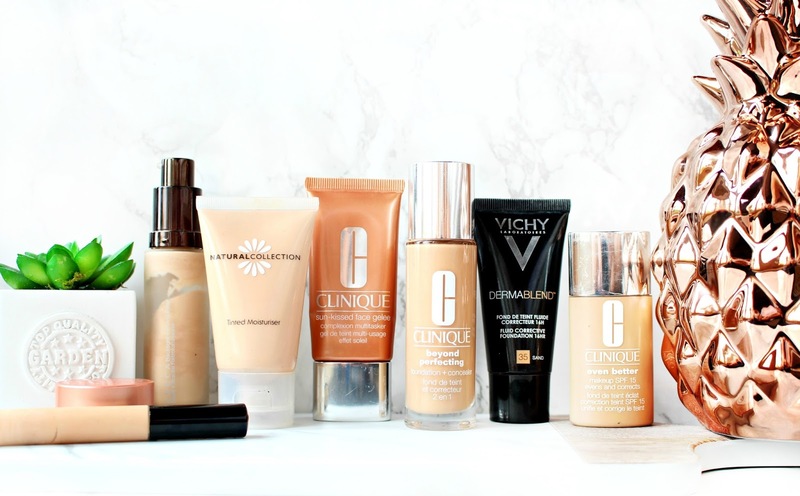 Sticking with Clinique, the Beyond Perfecting 2-in-1 Foundation is one of my absolute favourites and has featured on my blog quite a few times. It's flawless, richly pigmented and long lasting coverage makes it a go to foundation for long days at work, evening's out and events. Moving onto another amazing foundation the Vichy Dermablend definitely gives the most full coverage base, but with a damp beauty blender and some simple blending you can still make this look natural. I love how long lasting this foundation is and it's even more pigmented than the Clinique 2-in-1. I often mix this with my BECCA primer, which gives it a lovely radiant sheen. Finally, we have the Clinique Even Better Foundation SPF15, which gives a buildable light to medium coverage making it perfect for everyday use. I'm on my fourth bottle and I can see this one staying in my collection for a very long time as it's so versatile, plus it's oil-free, which works so well for my normal to combination skin. 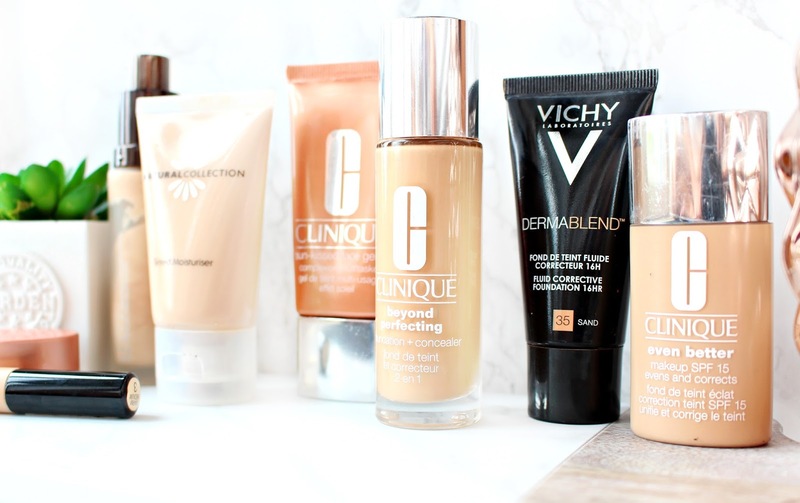 I hope you've enjoyed this post and I would love to hear about your favourite beauty bases?